The ensemble made its debut at the 1998 Vision Festival, performing Jimmy Lyons chamber-orchestra work Something Is The Matter at the festivals memorial tribute to its late composer. 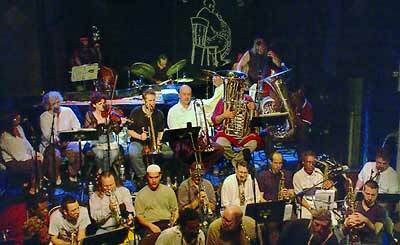 Over the course of the next year, the group expanded nearly two-fold for its 1999 Vision Festival premiere of Alan Silvas Mystic Pilgrimage - a multi-media work dedicated to composer-saxophonist Marion Brown - which they subsequently documented on audio and video recordings for commercial release by Eremite Records and Context Studios Productions. The resulting debut CD, Alan Silva & the Sound Vision Orchestra (Eremite MTE 026), has won high praise from music critics, including those at Wire magazine, who named it as one of the years top 15 jazz CDs. Ensemble members have continued their collaborative engagement with Silvas work into the new millennium, performing with him at venues such as Context and the Knitting Factory, and providing the core membership for his new Celestial Communications Orchestra. The year 2000 brought growing recognition for the orchestras artistic achievements, as the Mary Flagler Cary Charitable Trust provided funds to commission a concert-length work from acclaimed composer-musician Bill Dixon. Enthusiastically received by a capacity crowd at its Vision Festival 2000 world premiere, INDEX represents a landmark work in Dixons oeuvre that the ensemble seeks to present to audiences worldwide. At present, SVO is engaged in raising funds for a comprehensive recording of this ambitious piece and investigating opportunities for further performances. The excitement surrounding INDEXs premiere - as well as its composers own example - inspired ensemble members shortly thereafter to organize as an independent not-for-profit membership corporation. To inaugurate this new collective initiative, the ensemble premiered works by member artist-composers Steve Swell and Warren Smith at Vision Festival 2001. SVOs Composers Forum series continued with a concert at Roulette featuring a program of works by Rob Brown, Will Connell, Jeff Hoyer, J. D. Parran, and Warren Smith, dedicated to the orchestras recently departed bassist and board member Wilber Morris. The next concert in this series will take place at the YWCA-NYC (610 Lexington Avenue @ 53rd Street) on Friday 26 September 2003. In 2002, the organization received a grant from the Mary Flagler Cary Charitable Trust to commission a new concert-length musical work from renowned composer-pianist Cecil Taylor. Conceived and scored for twenty-three piece improvising orchestra, the piece also featured three vocalists performing a text written by Taylor himself. The orchestra presented the world premiere of this composition, With Blazing Eyes and Opend Mouth, at the Knitting Factory in lower Manhattan on 20-21 June 2002, with Taylor leading the ensemble and performing on piano. This premiere engagement was recently named Outstanding Alternative Jazz Performance of the year by a panel of 23 distinguished critics, including Gary Giddins of the Village Voice, at the first annual Nightlife Awards. The unqualified success of these performances, in the eyes of the composer, musicians, critics, and audience members alike, inspired Taylor and SVO to pursue opportunities for further collaboration. Most recently, SVO received a grant from the Fund for U.S. Artists at International Festivals and Exhibitions to support its premiere European performance with Taylor at the Skopje Jazz Festival on 22 October 2002. Taylor led the fourteen-piece orchestra and performed as featured piano soloist, in a newly composed work that further developed the dynamic large-ensemble conceptions laid out in With Blazing Eyes.